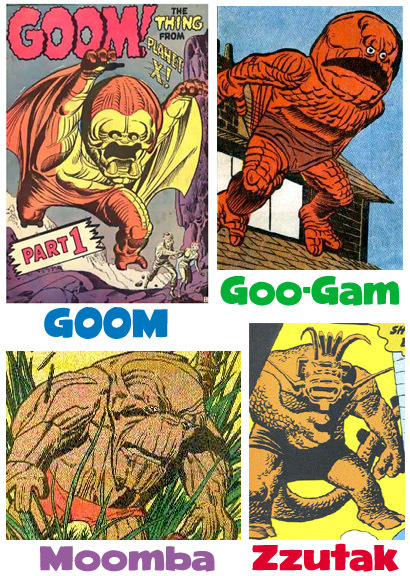 Marvel's Mighty (and Modest) Monsters! Before Marvel Comics entered the superhero genre with The Fantastic Four in 1961, they published a seemingly endless parade of giant monster stories...featuring hordes of blunt-fingered, gape-mouthed Kirby creatures. 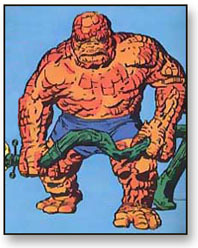 As a founding member of the Fantastic Four, the Thing served as sort of a "bridge" between Marvel's monster-centric past and its superhero future. You see, not only did the Thing echo the frightening appearance of his sci-fi predecessors, but their affinity for underwear as well! That's right...you heard me. Underwear! Despite their status as giant radiation-spawned behemoths or rampaging alien conquerors, a surprising number of Marvel Monsters demonstrated a remarkable sense of modesty by wearing huge briefs (or boxers) over their unmentionable regions. Why? Who knows...I could take the easy route and assume the Comics Code Authority insisted that a monster who walked like a man should also dress like one. My theory? Simply this: Jack Kirby, Steve Ditko and Stan Lee probably just got a kick out of 200 ft. tall monsters running around in their underwear. If anyone else knows of any Underwear Monsters I've missed, leave a comment or shoot me an email! There must be a complete accounting of these unique creatures! Turn-Offs: Idealistic young scientists who devise 11th hour solutions to defeat him • People confusing him with Gruto, Creature from Nowhere • Termites. Occupation: Volunteer representative of a hostile alien race sent to conquer Earth. Think "completely evil version of the Peace Corps". Abilities: Can alter reality to suit his wishes; levitate entire cities; reconfigure atomic structures; animate inanimate objects; mass hypnotism; excellent singing voice. 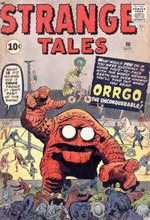 History: Orrgo began his invasion of Earth by appearing at a circus and immediately claiming the planet for his alien race. After demonstrating his vast reality-alterning powers and hypnotizing all of humanity, a weary Orrgo returned to the circus and fell asleep. While he slept, an escaped (and non-hypnotized) gorilla named Jo-Jo struck Orrgo in the head, killing him instantly. When Orrgo's home planet learned of his ignominious end, they canceled all plans to invade Earth. from Outer Space" (Journey Into Mystery #57, 1960). Occupation: A robot warrior awaiting orders to attack mankind while disguised as the ancient Egyptian Sphinx statue. Size: 241 feet long, 66 feet high (the actual size of the Sphinx). Abilities: In addition to super-strength and invulnerability, Shagg could also manipulate "Cosmo-Gamma Electro-Magnetic waves" to reconfigure reality. 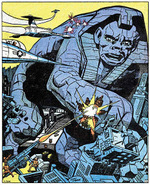 History: Unwittingly activated by an archaeologist exploring the Sphinx, Shagg came to life and set out on his pre-programmed mission of destruction. After trashing Paris and New York, the archaeologist explained that his activation was an accident and not part of his planet's invasion plan. Shagg, realizing he could not conquer a nuclear-armed Earth alone, used his matter reconfiguration powers to repair the damage and return to his inert Sphinx-state. Noteable Quotes: "Shagg lives again! Earth is doomed!" Abilities: Sentience and speech; Impressive lumbering skills; Ability to grow to giant size; Building-demolishing strength. History: When an atomic explosion's "Delta Rays" struck a farmer's field, their radiation caused a scarecrow posted in the field to come to life. Growing to immense size, the Scarecrow plodded its way through town to the office of Jarvis Cragstone, a greedy banker who'd foreclosed on the farmer's land. Once the creature intimidated Cragstone into returning the farmer's money, the slowly-shrinking scarecrow shambled back to the homeless farmer, secretly left him the sack of money, and returned to its lifeless state. 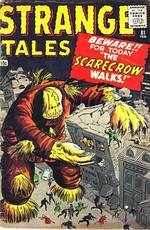 The animated Scarecrow plods toward town in Strange Tales #81. Note how the creature's rampage nearly caused Bobby to lose his precious comic books! Noteable Quotes: "I am your nemesis, mortal! Look upon me and tremble! Feel the awesome power of the Strawman!" Turn-Ons: Delta Rays • Farmer Albert Smith and his wife Martha • John Mellencamp's 1985 hit song "Rain on the Scarecrow"
Occupation: The ruler of a planet populated by wooden beings. 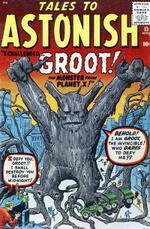 Not to be confused with: Groot, the ruler of a planet populated by wooden beings. 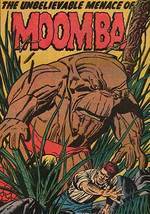 Powers and Abilities: Moomba was composed of bulletproof wood and could generate "ultra-frequency energy" that could bring tiny African totem statues to life. He could also fly through space and manipulate humanity's collective memory. History:In addition to ruling a race of wooden creatures, Moomba was also an advance scout who came to prepare Earth for an invasion. His plan? Secretly placing wooden totem sculptures around the world which would come to life and attack at his command! After unleashing his tiny soldiers and successfully taking over the world, an African shaman named Katu created a powerful potion that drove Moomba and his totem army from Earth....but not before Moomba erased all memory of his existence from the minds of humanity. Noteable Quotes: "On the world from which I come, all life is made of wood." Turn-Offs: People calling him "Moonba", "Moobah, "Obama", or "Woody"
Powers and Abilities: In addition to his superhuman strength and giant size, the Hulk possessed the power of telepathy, telekinesis, and mass hypnosis. History: Escaping from an intergalactic prison, the Hulk's malfunctioning spaceship crash-landed on Earth. Found and revived by electrician Joe Harper, the Hulk showed his gratitude by overpowering the human and placing the entire world under his hypnotic control (except for Joe). As hypnotized humans built the Hulk a new spaceship, the wily Joe used his electronics prowess to sabotage the spaceship, sending a helpless Hulk into orbit around the sun. The hypnotic effect on Earth's population slowly wore off, leaving only Joe Harper to remember what happened. Ah, but the story doesn't end there! In a rare Monster Age sequel, the Hulk returned to Earth four issues later for a rematch with arch-enemy Joe Harper. As the Hulk attempted to disintegrate Joe with his mental powers, the quick-thinking electrician reflected the energy back toward the Hulk with a mirror, causing the alien to dissolve. Noteable Quotes: "Fool! You have no choice! You must obey me! No living thing can defy the living Hulk!" Turn-Offs: The green-skinned upstart who stole his name, forcing him to be known as "Xemnu, the Living Titan" for his occasional appearances in the modern, post-monster Marvel universe. Things were so much easier in the old days. Unlike the recent Secret Invasion by the Skrulls, which required an 8-part series and multiple tie-ins to defeat, it didn't take much to repel the first invasion of the shape-changing aliens back in Fantastic Four #2 (1962). Posing as the defeated Skrull agents who'd been impersonating them, the Fantastic Four visited the Skrull mothership to convince its commander to call off the invasion. What did ultra-genius Reed Richards use to strike fear into the Skrulls? Expose them to the common cold virus? Show them a mighty super-weapon of his own invention? A giant projected illusion of Earth's spaceship armada? The Ultimate Nullifier?!!? Nope. He used panels from sci-fi comic books...specifically from titles Marvel was still publishing! 1. Whose comic books were those, anyway? You could assume they belonged to young Johnny Storm (who's just a teenager at this point in time), but the fact that Reed was even aware of the images suggests the comics might have been his! Personally, I think Ben Grimm was comic book reader, since the vaguely subliminal nature of each F.F. member's powers suggests Ben was familiar with the grotesque array of Marvel Monsters, and may have,in effect, become one when the cosmic rays did their thing. Sue? Come on...girls don't read comics (KIDDING!!!). As you can see from the final panel, she seemed more concerned about her hair than silly old comics, anyway. 2. How do you get promoted to the position of Skrull Armada Commander without being able to tell the difference between drawings and photos? 3. Those are some big, honkin' comic book panels Reed "clipped". The Red Monsters: These guys seem to be a combination of Rommbu from Tales to Astonish #19 (1961) and one of the red "Space Beasts" from the cover of Tales to Astonish #29...although the latter wasn't published until March of '62 (but may have been on the drawing board). 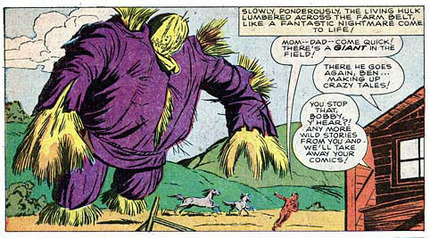 The Giant Ants: The closest thing I could find to a giant ant army were the covers of Strange Tales #73 (1960), featuring Grottu, King of the Insects or Krang the Unbelievable from Tales to Astonish #14 (1960)... although neither of them appear to be as large as the ants in Reed's clipped panel. The Orbiting Space Mine: I got nothin'...though I have to say, I hope somebody at the Pentagon gives it some thought. 5. How did the Fantastic Four resist bursting out into loud, bawdy laughter at the toolish idiocy of the Skrull commander? Their poker faces in the final panel are amazing! 6. Despite the jaw-dropping desperation of Reed's last-ditch ploy, it nonetheless demonstrates one of the many practical uses for comic books (besides scaring off potential friends): Alien Invasion Preventer! Keep a few handy just in case! Know Your Marvel Monsters: The Two-Headed Thing! History: Tunneling up from the Earth's core, the Two-Headed Thing used its shape-changing ability to mimic a tree and an alligator. While attempting to duplicate the form of an escaped prisoner, the Two-Headed Thing was struck by lightning and killed. Powers and Abilities: In addition to his ability to tunnel through solid rock and communicate telepathically, the Two-Headed Thing could also alter its size, shape, and color to imitate any object. Not to be confused with: the early version of the (one-headed) Thing or The Thing With Two Heads.